« New School Garden & Chick Project! Well done to the girls on their victory at the Letterkenny District FAIS 5 a side competition at Ballyare. They recorded seven straight victories on the day. 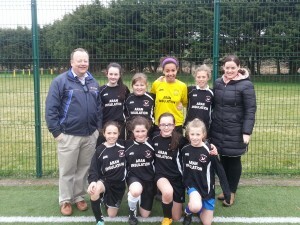 This qualified them for the Donegal Soccer Finals. They won this event too, recording another three impressive victories. The team then qualified for the Ulster Finals, held in Cootehill in Cavan on Thursday, 23rd April. The team performed well on the day, defeating the Monaghan champions 14-1, drawing 2-2 with the Cavan team (and eventual champions), while we were edged out by 4 goals to two in a great game by the Inishowen champions. Our teams’ heroics weren’t sufficient to qualify for the All Ireland final but the girls can be proud of their effort. Print article This entry was posted by Admin on April 20, 2015 at 11:13 am, and is filed under General. Follow any responses to this post through RSS 2.0. Both comments and pings are currently closed.